After almost ten years in Portland, Oregon, the time had inevitably arrived to say goodbye. Texas-sized opportunities were presented to my wife Julie and I and now here we are, lock, stock and barrel: job offers accepted, house sold, house bought, new neighborhood, new schools, new everything. Texas was never on our radar, but after 3 short months we are indeed happy to call ourselves Houstonians. This city has been beyond welcoming and its one-of-a-kind personality reveals itself around every corner. Our 2,241-mile journey caught the attention of Houstonia magazine and was featured in their humorous Escaped Converts column. Pretty cool. Most of all though, I’m excited to finally say that after months of unpacking and setting up our new shop space, Nutmegger Workshop is back and ready to take your orders! Have a pint, change the world! Nutmegger workshop is so proud to have worked with the Oregon Public House to help further their mission — a genuine leap of faith which continues to inspire others to make a real difference. Absolutely brilliant. Please watch this great 3-minute video. Just click on the image! Recently, we were honored to be interviewed by Sarah Coombs, the multi-talented interior designer, set designer and former NBC Today show art director. 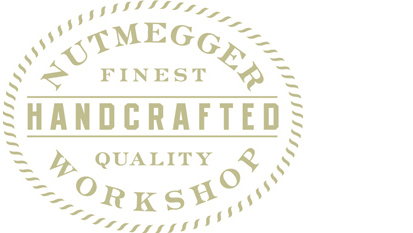 I had the good fortune to be introduced to Peter Vogel, head of Nutmegger Workshop. In his studio in Portland, Oregon, Peter crafts some truly remarkable sign art. He planes the wood, paints the type, and then ages it by hand. The result is a piece that feels one-of-a-kind: something that you’d be thrilled to find in an antique store, but that you have the good fortune to customize any way you want. His clients include retail stores, interior designers, and non-professionals, too — anyone who wants something unique to deck their walls. We spoke recently to discuss his craft, his sources of inspiration, and his favorite projects to date. Disney, Apple, Google, Amazon, Hewlett-Packard, Harley Davidson and Nutmegger Workshop all started in a garage. It’s that “can do” place where seeds of inspiration are nurtured during long hours under bare light bulbs and alongside mowers, gas cans, shovels, rakes, bicycles and baseball bats. Most of these companies moved on to larger spaces and set their sights on diversifying and dominating the global markets — but one company decided to stay put, to stay small, to stay focused and true to its mission: Nutmegger Workshop. I know, right? I should have been a writer. We’re in our fifth garage now. The fourth was actually a basement, and the third was a 30'x40' detached renovated barn with 10-foot ceilings—hardly a garage. At 1200 square feet, it was work space that mortal men only dream about. My wife Julie called it the Taj Mahal. “Great things better come out of this shop!” Our current renovated space, about half the size, is high in the West Hills of Portland just minutes from downtown. A completely transformed garage space with brand new windows, insulation, drywall, attic, heat, double-basin utility sink, 16 electrical outlets, and state-of-the-art, energy-efficient T-5 natural-light fluorescent lighting. Hoowaaah! We have all the room and tools needed to work smarter and more efficiently than ever before. No mowers, no gas cans. And the view out the back is just killer. Our new nameplates are in! I never sign the back of my work. Something about it doesn’t feel right. Many craftsmen take pride in branding their work with a wood burning iron, but I’d never be satisfied with the inconsistent image, let alone having to wait for the thing to heat up. So, we always used shop-made labels individually cut with an Xacto knife from a 20-up, 8.5"x11" color logo sheet, then spray glued to the back of our work. It looked professional enough until the label fell off a few months later. It finally dawned on me when I found myself reading the manufacturer’s badge riveted to our 1940s-era table saw. How perfect would that be? I found a company online (Cubbison) that specializes in laser- and acid-etched metal nameplates and by the end of that week I submitted our new logo art. Three weeks later they arrived on the shop doorstep. At just 2.5"x 1", these sweet little badges make a huge statement — and now I’ll always feel a rush of pride as I position these on the back of our work and tighten down the screws. Vintage photographs are a key source of inspiration. One image that keeps inspiring is this 1900 scene at the corner of School and Washington Streets, the very core of Boston’s historic beginnings. The well dressed men, the bricks and cobblestones, the multitude of signs (30) and the clarity of detail — truly mesmerizing. This building is said to be Boston’s first brick-made structure and dates back to 1712, which makes it just short of 200 years old at the time this photo was taken in 1900. I just assumed the building had succumbed to the passage of time ages ago — who wouldn’t. I couldn’t believe my eyes when we happened upon this exact location while walking the city's Freedom Trail a few years ago. There it was, beautifully restored, enchanting as ever. I had to pinch myself. Step into the ultra high-resolution original of this photograph at Shorpy Historical Photo Archive by clicking on the above image. You’ll be amazed. We recently made a replica of a section of the Damrell & Upham Booksellers facia signs that hang above the awnings. For more history on The Old Corner Bookstore, click on the below image to link to our gallery.